This was a puzzling book for me. As I read, I kept thinking “I should love this. I should absolutely love this”, and yet, for some reason, I didn’t. I liked it; it has a lot going for it. But it never quite reached AMAZING status. First off, Thimble Down is extremely charming. It’s sort of like reading a mix of The Wind in the Willows and the first chapter of The Hobbit. This is why I was having trouble understanding why Thimble Down just wasn’t wowing me. I love both of those books, so therefore, I SHOULD feel the same way about Thimble Down. Perhaps it wasn’t zany enough (like poor Bilbo’s Unexpected Party), or it wasn’t whimsical enough (like Mole discovering life outside his underground home). Our main hero, Dorro Winderiver is a bit of an amateur investigator, who enjoys afternoon tea a bit more than mysteries. While this sounds like the charming part, there were whole sections dedicated to Dorro’s eating habits. The slow pace of the book, especially at the beginning, was my biggest disappointment. Very little happened for a good while, and when something finally did happen, it didn’t happen to anyone I cared about. Even then, things continued to move slowly. Slow pace aside, the writing style in Thimble Down is lovely. Charming character voices, clever humor, entertaining descriptions of the inhabitants of Thimble Down and the work they do there all kept me interested enough to keep reading. Certainly there is a mystery to be solved, but again, it was not one I cared too much about. Dorro isn’t much of a hero at all, in the fantasy sense of the word; he prefers his books and, of course, his food. The cast of secondary characters is charming and humorous, bumbling about trying to solve a murder. Few are up to the task, but it is certainly entertaining to see them try. 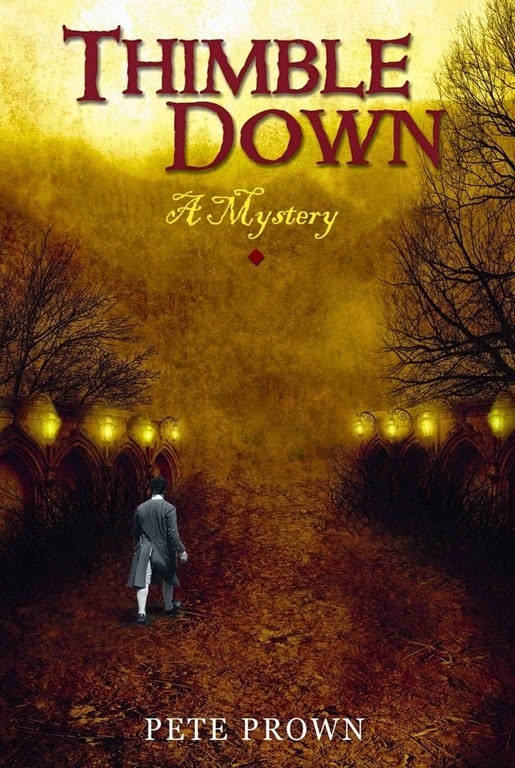 I don’t recommend Thimble Down if you’re looking for an exciting, edge-of-your seat thrilling fantasy novel. If, however, you are looking for a pleasant read to accompany a rainy day and a cup of tea, Thimble Down is the book for you. This entry was posted in Book Reviews, Fantasy, YA and tagged Fantasy, Review Request, YA.